It’s almost that time of year again- Jack Frost is starting to nip at our noses, Christmas tree stands are popping up and everywhere you look there are miles of decorations. Christmas is officially around the corner. While that statement might bring a twinkle to your eye and some items to your shopping list, the sad reality is that approximately 16.4 million American children are currently living in poverty. The kick-off event for the 2015 “Toys For Tots” drive will be held on December 4th in front of the Ward Black Law offices from 7am to 6pm and is open to anyone who would like to donate to this worthy cause. Just bring new, unwrapped toys for children from infants to 12-year-olds to one our donation sites before December 19th. Monetary gifts to “Toys For Tots” are also appreciated, but not required. 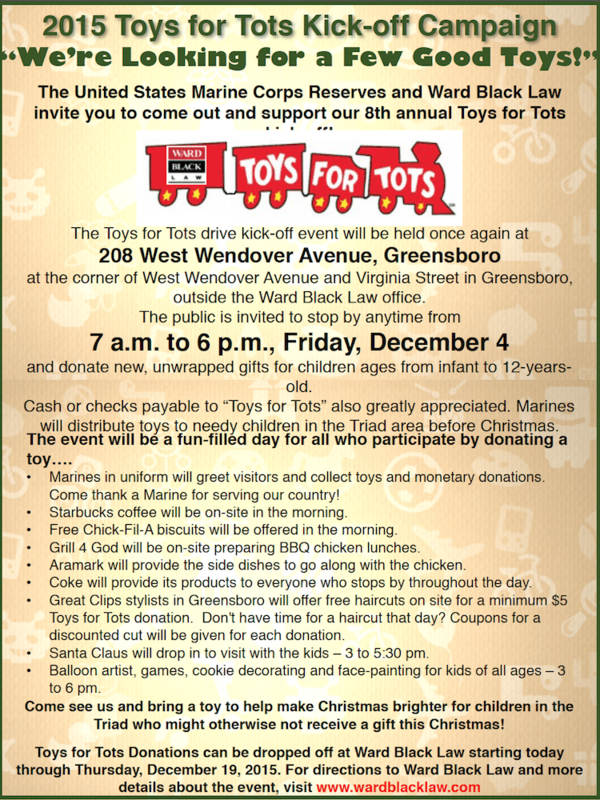 Donated toys will be delivered to needy children in the Triad area by volunteer Marines before Christmas Day. Please see the flyer below for specific event details or call (336) 333-2244 for more information. We hope to bring some cheer to the less fortunate in the Triad area this Christmas and hope you will join us!